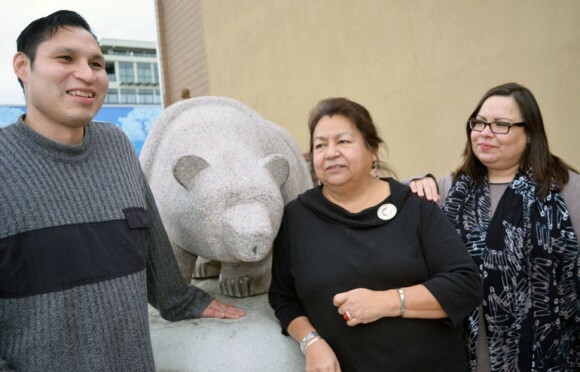 Shane Stonechild, left, chats with Ki-Low-Na Friendship Society (KFS) Executive Director Edna Terbasket, middle, and KFS Education Coordinator Veronica Roesler about UBC Okanagan’s Writing 009 course which begins in downtown Kelowna next week. UBC Okanagan and the Ki-Low-Na Friendship Society are piloting a project that will open the door for Aboriginal youths and adults who are interested in pursuing post-secondary studies. The Downtown Education Project will offer an introductory UBC writing course at the Ki-Low-Na Friendship Centre on Leon Avenue, explains Adrienne Vedan, Director of Aboriginal Programs and Services at UBC. The pilot will combine both academic and non-academic programming to prepare students who are interested in transitioning to post-secondary. Through the partnership, students will be able to access a holistic array of programs in the downtown setting that will meet the academic, social, cultural, and physical aspects of being a student, says Vedan. Edna Terbasket, Ki-Low-Na Friendship Society Executive Director, says the project partners agree that offering the UBC courses at the downtown centre removes several barriers and provides participants with a comfortable and familiar environment. The first course offered in the Downtown Education Project is UBC’s WRIT 009: Preparation for University Writing which is taught from an Aboriginal perspective. Additional post-secondary transition and orientation programming will also be offered as part of the Downtown Education Project. The pilot course runs from mid-January to April and Vedan says it is an ideal choice for the initial option in the project. The Downtown Education Project’s first class starts this week. UBC Deputy Vice-Chancellor and Principal of the Okanagan campus Deborah Buszard says one of UBC’s goals is to expand educational opportunities for Aboriginal people. “In partnership with the Ki-Low-Na Friendship Society, we are creating important new opportunities for young people and adults who may not have completed high school and otherwise might not see themselves pursuing post-secondary education,” says Buszard. For further information about the Downtown Education Project, please contact Veronica Roesler at the Ki-Low-Na Friendship Society 250-763-4905.